“No meaning, no symbols, no sense” was one pre-war American verdict on mining magnate Solomon Guggenheim’s collection of abstract art. Why does abstraction leave many people scratching their heads? As the astonishing selection from the collections of Solomon and Peggy Guggenheim at Palazzo Strozzi demonstrates, art that depends on form, colour and gesture empowers the viewer’s personal perceptions. Abstraction was the dominant creative force in the visual arts of the last century. Many artists followed this trend in the 1900s, but just a few can be remembered as the best proponents of this form of art. One of them is, for sure, Vasily Kandinsky (1866–1944), whose paintings are now shown at Palazzo Strozzi in Florence, Tuscany. 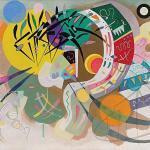 Kandinsky’s Dominant Curve welcomes visitors to Palazzo Strozzi’s highlights from the Guggenheim collections. 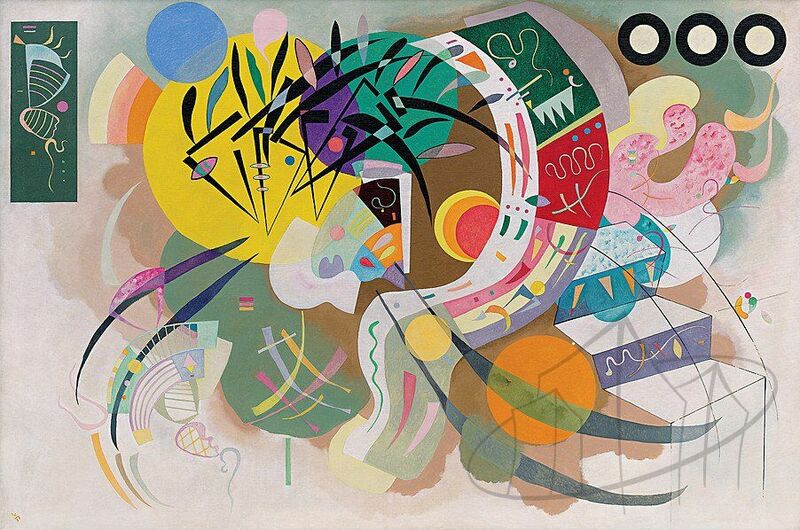 When made in April 1936, Kandinsky was fascinated by embryology and botany; numerous light-coloured organic shapes appear to circulate within the perimeter of the painting like basic life forms seen through a microscope. Nearby is Theo van Doesburg’s (1883–1931) Composition XI from 1918. Here, too, buoyant shapes float on the white surface of the canvas. But these forms are roughly rectangular and colour is limited to subdued red, yellow and blue. In radical contrast with Kandinsky’s image of teeming energy, this composition is in search of its own quiet balance, a sensation it conveys to the viewer. Along the way the visitor’s senses are buffeted and elated by form, tone and gesture as if walking through frequent changes in the weather. The expressive impact of paintings by Hans Hofmann, Willem de Kooning, Sam Francis and Joan Mitchell animates space itself. Two artists are accorded their own galleries. In one, 18 works trace the decade-long evolution of Jackson Pollock’s (1912-1956) painterly language from turbulent, ritualistic symbolism to completely abstract, his “all-over” style exemplified by Watery Paths from 1947, for which Pollock trailed paint from a brush or stick as he circled in rhythmic movements round the canvas laid flat on the studio floor. The result is dizzying: an intoxicated surface of crisscrossing tendrils of colour and matter. In another, a mini-survey of Mark Rothko’s (1903–70) work, five spotlit paintings hang on black walls. Their surfaces of orange, burgundy, red, brown and black in soft-edged rectangles infiltrate the room and hover like vapour clouds modelled by atmosphere. Rothko’s work echoes Kandinsky’s search for spiritual reality, culminating in Untitled (black on grey) from 1969 to 1970, made just before he died. A still horizon separates flat, cold colours; light has gone, and with it hope. This exhibition tells three stories. Abstraction occupies the first while the second starts when Solomon R. Guggenheim retires from business after the Great War to devote his wealth to collecting art. The third story belongs to his independent niece, Peggy Guggenheim. A freethinker who broke rules, this remarkable woman brought artists together who eventually transformed the post-war art scene. There is, finally, a fourth story in this exhibition, related to Palazzo Strozzi itself. After the authorities in Turin rejected the work as too modern, in February 1949, Peggy Guggenheim’s collection opened the new cellar galleries of the Strozzina.